A lawyer connected to proceedings in connection with leal activities concerning Madush says that Makandure Madush who currently is in custody in Dubai has made a request from High Court in Dubai not to expel him to this country. information to the fact that much of Madush's assets are in that country. 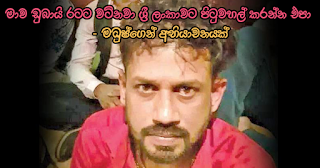 Though this individual called Madush is notorious as an international drug-dealer, there have been no records in that country to say that there are accusations linked to him where narcotics are concerned. He has forwarded an elaborate description in his appeal on various matters saying that he acquired all that wealth after legally registering a business in that country and has thus pleaded to leave an opportunity to further serve the country of Dubai.